18 free flat stock icons for Windows applications ribbons & toolbars. The style is pure, flat and simplistic with solid colors, making them suitable for applications in the style of Windows 8 and Office 2013. Provided sizes are compatible with ribbons and toolbars of Windows applications but can also be used in websites, illustrations and mobile applications. Icons are provided in sizes 16x16, 20x20, 24x24, 32x32, 40x40, 48x48, 64x64 and an extra large set 256x256. Normal, hot & disabled states are provided for all formats. Available file formats are PNG, ICO and BMP (256x256 in PNG format only). Icon sizes comply with Microsoft specification for creating DPI-aware applications (96-DPI to 192-DPI screens). Pixel density has been set to 96 PPI making the icons compatible with latest Microsoft .NET development platforms such as Windows Presentation Foundation or Silverlight. They are also compatible with C++ User Interface libraries such as MFC, BCGControlBar Library or Codejock Xtreme ToolkitPro. A PRO VERSION of the Basic Set is available on Axialis website. 1,500 unique icons are available in the set. 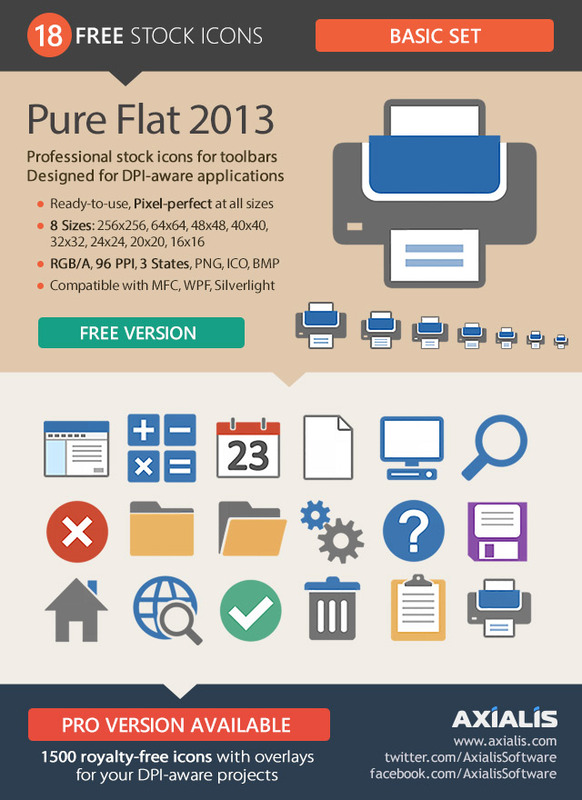 The Pure Flat 2013 Family is composed of several sets: Basic Set (1500 icons), Database Set (869 icons), Business Set (1713 icons), Multimedia Set (1237 icons), Word Processing Set (1298 icons), User Management Set (1922 icons), Imaging Set (1132 icons), Hardware & Network Set (1858 icons), Web & Email Set (1780 icons), Spreadsheet Set (948 icons), Development Set (1659 icons), Medical Set (1809 icons), Transportation & Logistics Set (1922 icons), Security Set (1682 icons) and more to be released.